﻿ Fun Easy English - Environment - Global warming - Climate change Indicators: Snowpack. This indicator measures trends in mountain snowpack in the western United States. From 1955 to 2016, April snowpack declined at more than 90 percent of the sites measured (see Figure 1). The average change across all sites amounts to about a 23-percent decline. Large and consistent decreases have been observed throughout the western United States. Decreases have been especially prominent in Washington, Oregon, and the northern Rockies. While some stations have seen increases in snowpack, all 11 states included in this indicator have experienced a decrease in snowpack on average over the time period. In the Northwest (Idaho, Oregon, Washington), all but three stations saw decreases in snowpack over the period of record. Temperature and precipitation are key factors affecting snowpack, which is the amount or thickness of snow that accumulates on the ground. In a warming climate, more precipitation will be expected to fall as rain rather than snow in most areas—reducing the extent and depth of snowpack. Higher temperatures in the spring can cause snow to melt earlier. Mountain snowpack plays a key role in the water cycle in western North America, storing water in the winter when the snow falls and releasing it as runoff in spring and summer when the snow melts. Millions of people in the West depend on the melting of mountain snowpack for power, irrigation, and drinking water. In most western river basins, snowpack is a larger component of water storage than human-constructed reservoirs. Changes in mountain snowpack can affect agriculture, winter recreation, and tourism in some areas, as well as plants and wildlife. For example, certain types of trees rely on snow for insulation from freezing temperatures, as do some animal species. In addition, fish spawning could be disrupted if changes in snowpack or snowmelt alter the timing and abundance of streamflows. This indicator uses a measurement called snow water equivalent to determine trends in snowpack. 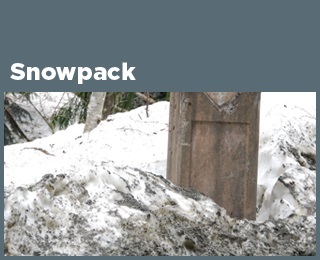 Snow water equivalent is the amount of water contained within the snowpack at a particular location. It can be thought of as the depth of water that would result if the entire snowpack were to melt. The U.S. Department of Agriculture and other collaborators have measured snowpack since the early 1900s. In the early years of data collection, researchers measured snow water equivalent manually, but since 1980, measurements at some locations have been collected with automated instruments. This indicator is based on data from approximately 700 permanent measurement sites in the western United States. The indicator shows long-term rates of change for April 1, the most frequent observation date, because it could reflect changes in snowfall, and it is extensively used for spring streamflow forecasting. EPA selected 1955 as a starting point for this analysis because many measurement sites in the Southwest were established in the early 1950s. Natural variability in the Earth’s climate means that snowpack trends may vary slightly when measured over different time periods. For example, the period from 1945 to 1955 was unusually snowy in the Northwest, so if this indicator were to start in 1945 or 1950, the Northwest would appear to show larger decreases over time. However, the general direction of the trend is the same regardless of the start date. Although most parts of the West have seen reductions in snowpack―consistent with overall warming trends shown in the U.S. and Global Temperature indicator―snowfall trends may be partially influenced by non-climatic factors such as observation methods, land-use changes, and forest canopy changes. Data for this indicator came from the U.S. Department of Agriculture’s Natural Resources Conservation Service Water and Climate Center and the California Department of Water Resources. The map was constructed using methods described by Mote et al. (2005). The U.S. Department of Agriculture data are available at: www.wcc.nrcs.usda.gov. The California Department of Water Resources data are available at: http://cdec.water.ca.gov/snow/current/snow/index.html. 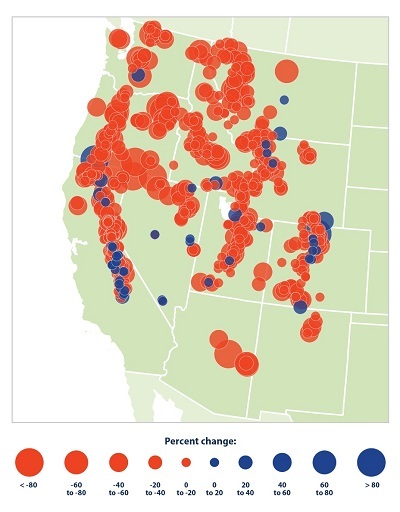 This map shows trends in April snowpack in the western United States, measured in terms of snow water equivalent. Blue circles represent increased snowpack; red circles represent a decrease.